After a 3.5 hour boat ride we arrived in Ko Phangan, via Ko Tao which looked absolutely beautiful with the clearest sea I have ever seen. Ko Phangan is famed for its monthly Full Moon party, but we had just missed that, it is also home to the 1/2 Moon party, Shiva Moon party and the Black Moon Party. We got off of the boat and there were loads of touts trying to get us to take us to their bungalows and guest houses, we walked through them to the main centre and managed to agree a price for a Sawngthaew (a pick up truck with seats in the back) to take us to a resort that had been recommended. We got there and the bungalow available did not have a flushing toilet, me being a snob, decided that I did not want to stay - I only want a little luxury! We flagged down another Sawngthaew to take us to Hat Yao bay, which is supposed to be one of the best on the island. The driver was not that great and managed to get lost, not really sure hoe on a small island, but trust us to pick the driver that does not know where he's going! We finally got to Bay View Resort and they had a lovely bungalow available so we took it. We had to walk on a little walkway above the sea to get to the bungalow, which was set just above the water, it was not too expensive and had a flushing loo. The beach was lovely and the view of the bay was stunning. In the evening the beach becomes a relaxing place to eat with most places having outdoor BBQ's with lots of fresh fish. We did not go for BBQ and had a nice Thai Massaman curry with potato and peanuts, Wayne had a Penang Curry which was really spicy - he loved it. We sat on the beach and enjoyed a quiet drink but by 10.30 everything seemed to have closed up and the tables and chairs were being packed up around us. The only bar that seemed to be open was one at the other end of the beach so we thought we would head there tomorrow. On our second day we spent the day relaxing on the beach and snorkelling in the bay, the coral here is lovely and there are fish so close to the shore. The sea is clear and the sand is soft a lovely spot to relax. We decided that we would try the BBQ at our hotel for dinner. We had Jacket Potato, Salad, corn on the cob and we shared a Shark & Barracuda steak. It was really lovely but quite expensive, we had splashed out. We had arranged to meet some people that were staying at our hotel in the bar at the end of the bay, the Eagle Bar. It was a very relaxed bar, with neon writing on the walls, bean bags to sit on and reasonable drinks. The friends we met, Amy, Cheryl and Ross took to drinking the Vodka buckets I just stuck to beer and vodka much safer than the amount of alcohol in the buckets! Our 3rd & 4th day, were really hot days, the weather has been great, we therefore decided to have another 2 lazy days, spent by the beach and the pool. The pool is an infinity pool so when you are sat in it, it looks as though it is flowing out in to the ocean. This place really is lovely. We started chatting to the couple in the bungalow next to us, Chris & Xania and went out for dinner and drinks with them. They had come from Oz, where they had been working and traveling. They were lovely and we chatted all night they gave us some really useful tips on Oz and working there, while we were able to give them tips of Vietnam and Bangkok. We rented a bike as we thought we should get ourselves out and see the island, we got one bike between the 2 of us and as we had heard horror stories of people coming off we got helmets too! We set off toward the port town of Thong Sala, from there we headed in to the centre of the island to visit the Than Sadet waterfalls. We had to go up some steep hills and at times I didn't think the bike was going to make it. We finally got to the first waterfall and walked down to it, there were only 2 other people there but there was not much water in it! We moved on quite quickly and the road began to get more like a dirt track and quite hilly. At one stage I had to jump off as it was easier for Wayne to control the bike without me on it! I jumped back on and we were taking it really slowly when it slipped, we both jumped landed on our feet, the bike fell. We were OK as we had jumped but the bike had a few scratches and the brake lever had snapped. We got to the next waterfall, me walking, which was much busier, there was a pool at the bottom and as it was Sunday a Thai family were playing in the water and eating a picnic. We decided not to go to the 3 waterfall as I was too scared of coming off so we headed back, the road back was fine. We passed an elephant camp and stopped at some great viewpoints up in the hills, we could see Ko Samui out over the sea. We got back to Thong Sala and stopped in the Mason's Arms, a British pub, it could have been picked up from any new housing estate and plonked down. We had heard that the pub did traditional Sunday lunches and as this was one of the meals we had missed most in 2.5 months we decided we had to try and it was lovely with proper home made Yorkshire Puddings. 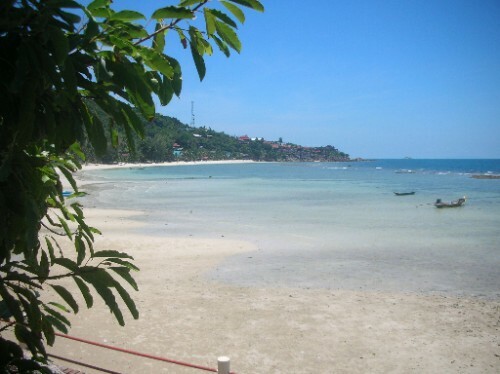 We then went on to Had Rin, the beach of the full moon party and the busiest beach on the island, we had a quick look at the beach and then decided to head back. On the way back we stopped and got the brake lever fixed, it would be cheaper than having to pay the owner. That evening we went for drinks with Xania and Chris as it was our last night. We left the Eagle bar about 1am and found a bar on the main road called the Rasta bar, we woke the guy up to have a drink and then a bit worse for wear we stumbled out about an hour later - good end to our time on the island.